As can be seen in the chart below, longer hours of labor does not increase the wages of the working class, nor do shorter hours of labor depress wages. In the euro-zone, as hours of labor fall (x axis), wages rise (y axis). 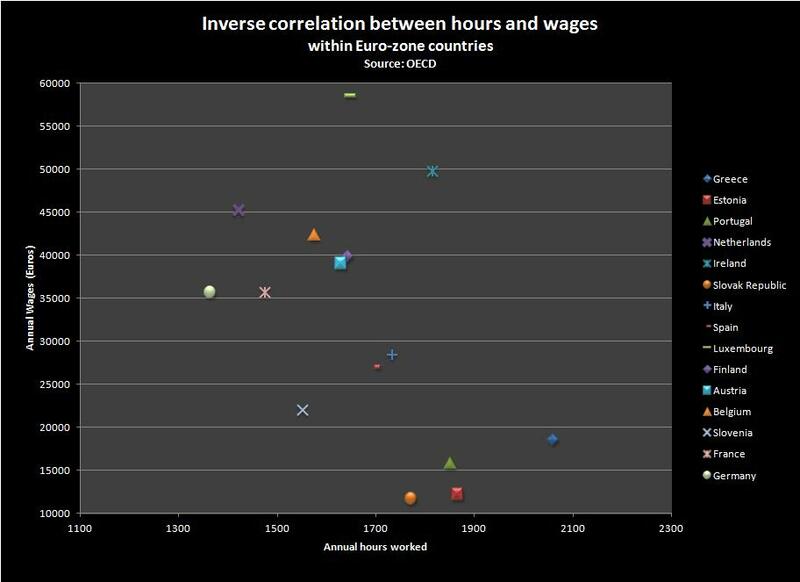 The euro-zone is a good case study for the empirical relation between hours worked and wages, because the common currency means there is no need to adjust for currency exchange rates. The data, provided by the OECD, shows that Greece, with the longest hours of labor, has among the lowest wages of the euro-zone countries, while Germany, with the shortest hours of labor, has among the highest wages in the euro-zone. There is a definite inverse correlation between hours and wages. Marxists who argue a reduction of hours of labor leads to a fall in wages have no empirical or theoretical evidence for their argument. They are just regurgitating the usual simpleton bourgeois nonsense that wage slavery is good for the working class. Did you finish your comment? I am not sure what you intended to say. Great Idea. I will work on this. what kind of drugs you take? I’m really interested…. Really? If a reduction of hours of labor reduces wages, would an increase in hours of labor increase wages? If the latter is not true, do hours of labor have any effect on wages at all? Really? You are going to have to do better than that. Your argument is just pitiful.